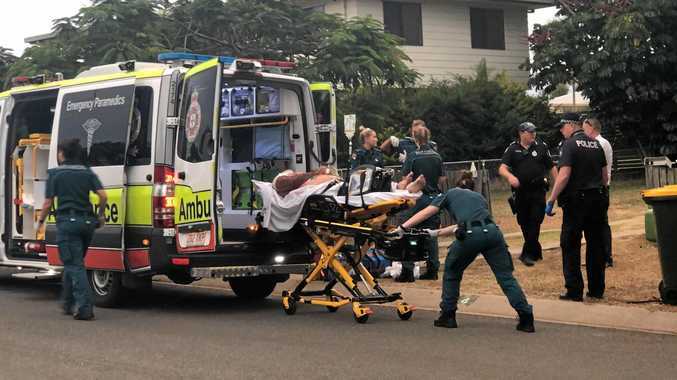 A MAN accused of attempted murder after a stabbing incident at Gracemere last week is one of three people involved in a long-term violent love triangle, a court was told. Daniel John Shields, 47, appeared in Rockhampton Magistrates Court yesterday for a bail application. He faces one charge of attempted murder of a 44-year-old man, Raymond Stephen Jarvis. Police were called to a Thora St address last Wednesday, February 6, where they found Mr Jarvis with substantial injuries. Defence lawyer Rowan King said there had been a similar incident where his client had been the victim. The court heard Shields' now-former partner Alison Whyte was convicted after stabbing Shields with a knife in November 2017. Police prosecutor Julie Marsden said she didn't dispute the fact Shields had been a victim himself by his former partner and that there had also been ongoing conflict between Whyte and Mr Jarvis along with Mr Jarvis and Shields. The court heard Shields had been convicted in November 2017 of wielding an axe and causing fear towards Mr Jarvis. He was ordered to a 12-month probation order. "It's been toxic for many years," Ms Marsden said. Magistrate Philippa Beckinsale said there was definitely three-way violence occurring. "It doesn't change the fact there's a clear escalation of violence here," she said. Mr King said his client had a large u-shaped laceration on his arm, which caused him to lose most of the use of his arm. He said there was nothing in the prosecution's case that explained how that injury occurred. However detective Senior Sergeant Luke Peachy addressed this during a media conference earlier yesterday. "What police will be alleging is that the victim was struck a number of times with the machete, twice in the head and once under the arm," he said. "We also understand that the offender in this case has also sustained quite a serious cut to his left arm but we will be alleging that was caused as a result of the assault." The court heard the prosecution's case relied on an allegation that Shields said to the victim: "Give me the knife. I'm going to finish you, c---." Mr King said his client denied this. Ms Beckinsale said the prosecution's case was strong, with a witness backing up Mr Jarvis's version of events. She denied Shields bail and ordered his case be mentioned on April 10.